And a very Happy and special Sai blessed New Year 2009. This is a special year as we start our day with HIS Great day Guruvar or Thursday ,we have Baba's number 2 denoting Shraddha and Saburi, Baba’s number 9 (9 type of bhakti /coins given to Lakshmi bai)and when we add the complete number 2009, 2+9=11.11 is Baba's 11 assurances. What a blessed Sai year 2009 we have for all of us!! What else we need but complete surrender at feet of Shri Sainath Maharaj. New Year has started on a very blessed way as I am happy to share so many things with Sai devotees on His great day . 1. 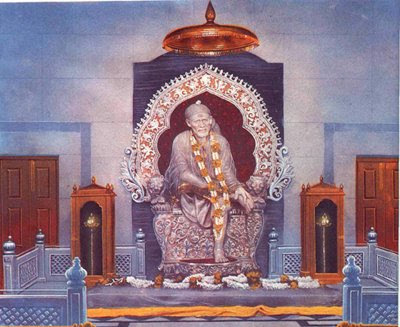 There are 3 beautiful Sai Baba original photos which can be downloaded and kept in mandir or where devotee wish to have it .You can have them by clicking Here. 2. A very beautiful Sai service started by Sai sevak/Sai devotee Jay for all Sai devotees across the globe "Sai Bhakti Radio”. Please click to read more about it Here. 3. Vishnu ji has created yet another beautiful heart touching video .Which I am giving detail here. Vishnu ji has been creating lot of video's dedicated to Shirdi Sai Baba and each is very unique and special in its own way .This one is really very nice and exclusive as we can see lot of things from Shirdi and simultaneously hear Guru Paduka stotram playing in background.Its a must watch for each Sai devotee. This is very beautiful and unique video as it has not only Baba's paduka being shown in different places in Dwarkamyi,Samdhi mandir but has complete beautiful tour of the Sai temple ,Dwarkamayi,Gurusthan,Chavadi ,Dhuni, Samadhi mandir ,Nand deep,Khandoba temple, article used by Baba and many more things to name....along with Sai Guru Paduka Strotram being played in background. I am attaching the video below for the Sai devotee to watch Shirdi Darshan and hear the melodious Sri Guru Paduka Stotram on this great start of New Year 2009. please click the play button to see the video and hear the stotram. Thank you again Vishnu ji for creating and sharing this Beautiful video with all of us. Here is the complete lyrics of the Sri Guru Paduka Stotram . And by worship of which, I attain the dominion of renunciation. Dhoorikrutha namra vipathithabhyam, namo nama sri guru padukhabyam. And which removes distresses of those who prostrate before it. Mookascha vachaspathitham hi thabhyam, namo nama sri guru padukhabyam. And which makes even dumb people in to great orators. Nama janabheeshtathathi pradhabhyam namo nama sri guru padukhabyam. And which helps fulfill the desires of those who salute. Nrupadvadhabhyam nathaloka pankhthe, namo nama sri guru padukhabyam. And which make the devotees attain the status of a king. Jadyadhi samsoshana vadaveebhyam namo nama sri guru padukhabyam. Ramadhavadeegra sthirha bhakthidabhyam, namo nama sri guru padukhabyam. Swanthachad bhava pradha poojanabhyam, namo nama sri guru padukhabyam. And which helps the aspirants to the state of realization. Bhodha pradhabhyam drutha mokshathabhyam, namo nama sri guru padukhabyam. And blesses the aspirant with speedy salvation. u r doing such wonderful job by creating such beautiful videos and all.